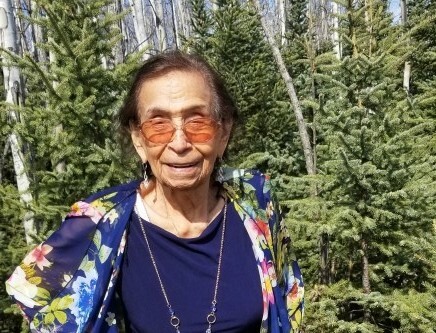 Juana L. Perez, 94, of Danville, IL, passed away peacefully and surrounded by loved ones, at 4:30 am, Saturday March 16, 2019 in Delta Junction, Alaska, where she called her home. Juana was born, August 28, 1924 in Ballinger, Texas to Ramona and Candelario Lona. She married Narciso Perez Sr. on February 13, 1943 in Gómez Palacio, Durango, Mexico. Juana loved her family very much, they were her pride & joy. She was a sweet lady with the biggest heart. Juana was very kind & caring. Juana never knew a stranger. Anyone who met her instantly loved her. Juana always had her arms wide open and accepted everyone. She enjoyed dancing, traveling, cooking, cookies & ice cream. If you ever visited Juana, she'd love to cook for you, no matter what time of day/night it was. She was a member of Holy Family Church. Juana is preceded in death by her parents; her husband, Narciso; three sons, Simon Perez Sr., Aureliano Perez Sr., and Merejildo Perez; one daughter, Maria Perez; one brother, Juan Lona; one sister, Bartola Lona; two grandsons, Aureliano Perez Jr., Benito Perez; one granddaughter, Elvira McKeon. She is survived by her six sons, Jose (Mercedes) Perez, Porfirio Perez of Mexico, Venancio (Betsy) Perez, Jesus (Kelli) Perez, Narciso Perez Jr. and Marcos Perez; four daughters, San Juana (Reynaldo) Guerrero of Texas, Manuela (Ramon) Perez of Texas, Rosa (Praxedis) Alvarez, Leticia (Paul) Donaldson of Alaska; 55 Grandchildren; 173 great-grandchildren; 52 great-great-grandchildren and several nieces and nephews. A Memorial Service will be held for family and friends on Sunday, April 7th starting at 1:00 pm at the Alaskan Steakhouse Banquet Center, Mile 265 Richardson Hwy, Delta Junction, Alaska.